On 3 August 1601, Prince Michael the Brave of Wallachia, allied with the imperial general Giorgio Basta, defeated at Guraslau (in Transylvania) the army of prince Sigismund Báthory, who had, apart from Transylvanians, help from units from Prince Ieremia Movila of Moldavia, from the Turks, Tatars and perhaps Poles. The very next day, prince Michael sent the Holy Roman Emperor Rudolph II, at Prague, 88 flags, while general Basta send him only 22. All these 110 flags were painted and described by the Austrian artillerist Georg Puchner on 21 August 1601. The water colour painting is found today in the Library of Dresden, Germany, volume G. 81. 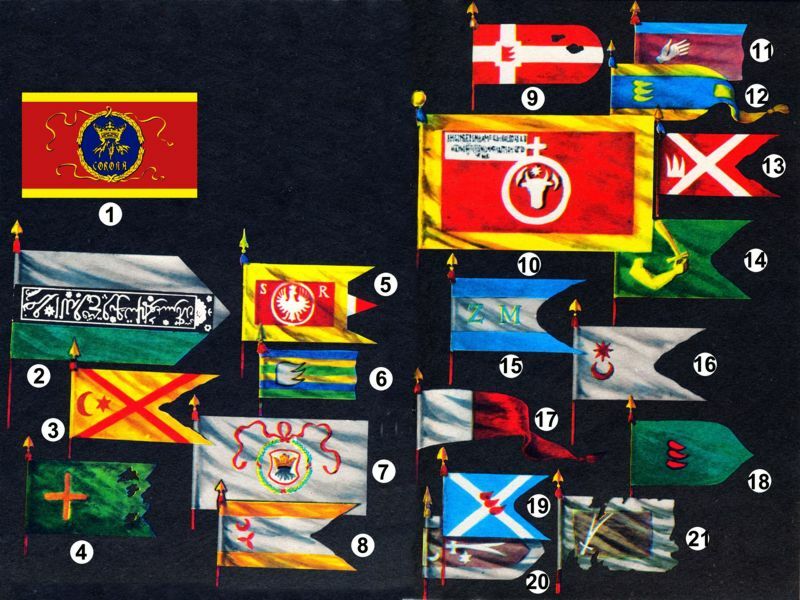 The image above is just a selection of these flags. is the flag of Ieremia Movila (and of Moldavia at that time) (nr. 10), with Moldavian coat of arms in the middle and his princely title in canton and the year 1601. There are 35 Transylvanian flags, bearing the arms of Báthory family, three wolf fangs (nr. 6, 9, 12, 13, 18, 19), 2 flags of Braşov city (nr. 1 and 7), one of Sighişoara city, one of Târgu Mureş (nr. 14). I believe nr. 5 is a Polish one. The Tatar and Turkish flags have Arab inscriptions or the crescent and star on them (nr. 2, 3, 16 and I'm not sure about nr. 8). Nr. 20 and 21 are similar, with their Zulfikar (Dhu'l-Fakar) sword, like in the Selim I's red standard. I have no information about flags nr. 4, 11, 15 and 17. Except the first two flags (of the Tatar commander and Ieremia Movila), 72 belongs to cavalry units and 36 to infantry. Other 1601 flags can be seen on this contemporary engraving: http://upload.wikimedia.org/wikipedia/commons/f/ff/Guraslau1601.jpg. The flags in the front and on the right are Transylvanians. The flags on the left are Wallachians. The flag used in the Principality of Transylvania between 1765 and 1918. It resembles the Coat of Arms of the principality i.e. its tinctures. It is a horizontal tricolour, blue-red-yellow, with a possible ratio of 3:5. It was definitely not 1:2, but one cannot find out its exact details because all we know today is due to historic reconstructions. The flag of Transylvania was red-yellow-blue, horizontally divided - the yellow was smaller than red (and the blue). Source: Book: "A székelyek nyomában; Budapest 1981"
A web page at http://www.geocities.com/Athens/Styx/2190/erdely.htm [no longer available] showed the Coat of Arms; you can find in the Romanian Coat of Arms 1920-194? and 1990-now and in the middle Coat of Arms of Hungary before 1918. The gold Sun and Moon in the blue field relates to the Szekely's (Hungarian peoples in Harghita-Covasna-Mures counties today (formerly Székely Land). The Black Eagle relates to the Hungarians (of course the noble Hungarians). The seven castle in the yellow field relate to the Saxon settlers who lived in Transylvania from the Middle Ages to the Ceausescu era. Transylvania became grand-duchy on 2nd of November 1765 by Queen Maria Theresa Queen of Hungary. Transylvania was grand-duchy 1765-1848 and 1849-1867. The Transylvanian national flag, the flag adopted in 1918, is a horizontal tricolor of red, green, and white. This is from Minahan (1996) "Nations Without States, Greenwood Press, 1996. pg 579. I know this text is infamous for not showing the flags in color or for listing separate flag sources, but this is one of the very few times in the book where he mentions a date of a flag adoption (during its brief period of independence 28 Oct 1918 - 1 Dec 1918). A flag used by Transylvanians of Romanian ethnicity within the Revolution of 1848. The golden inscription on white says "Virtutea Romana Reinviata" (in Romanian), or "Virtus Romana Rediviva" (in Latin), meaning "Revived Roman Virtue". Some Romanian historians say that the role of the golden inscription was to express the affiliation between Transylvanians of Romanian ethnicity and Romanians from the Danubian Principalities (that is Moldavia and Wallachia), but this is a highly argued subject among historians. Another flag is reported at http://www.flaggenparadies.de/europa/flagge-siebenbuergen-rumaenien-transsilvanien.html - blue-red-yellow with a coat of arms centred. This looks to me like a modern variant bringing together the Transylvanian colours (b-r-y) with the arms. I doubt that this was in widespread use in pre-1918 times.